Marjetina ustvarjalnica: Ste že pripravljeni? Ko sem malo pobrskala po ustvarjalnih blogih, sem videla, da ima veliko število ustvarjalcev svoje hišne ljubljenčke. Če se ne motim muce prednjačijo. Znajo biti malce nagajive, običajno pa so zelo prijazne - tako kot ta, ki vošči praznike. Sponzorsko šampiljko Scribbles (Peek A Boo) sem izbrala za tokratni izziv pri Creative Moment. - Distress blazinico za senčenje. - beccyschallenge: november , 1.12. Kako osvežujoče drugačna praznična voščilnica in mačka ... imenitno res! This is beautiful, a fabulous design and lovely colours. Great colour combination Margaret, it's not common to see these colours together on a holiday card, but they look fabulous. The cat image you used is wonderful and I like how you've placed him "peeking" through the window. I also like the string of ornaments at the side of the card. Great job! 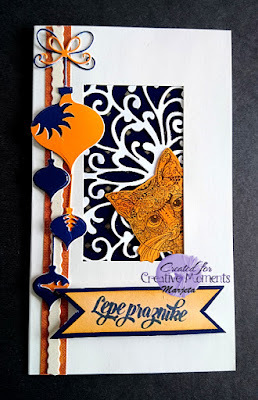 Very bold color combo, and I like this orange kitty peeking out of the filigree window. A lovely design to show off the Christmas baubles. TFS & Hugs. Thanks, too, for visiting after the long MIA by myself. Always so happy to see an old friend pop in to visit. Super card and I do love that naughty cat peeking round the corner! Very clever. Oh, my, what a fabulous cat, Marjeta! Love your card design and non-traditional colors. I'm really tickled that you are playing in our challenge this month at 2 Crafty Critter Crazies. Hope to see you again soon. What a beautiful card, Marjeta! Great colours! Kisses, my friend.